Frost still covers the ground that hasn't yet seen the sun's rays in this early-morning, autumn picture. Cloud rings the distant summits of Skiddaw, left, and Blencathra, centre. Rowling End shows in the middle distance, on the left. The northern ridge of Robinson is seen in the foreground, leading down to High Snab Bank, its continuation. To the right is the northern ridge of Hindscarth leading to Scope End. Beyond is Maiden Moor and its spur, Knott End. 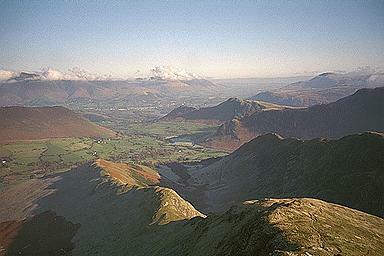 Beyond that is Catbells, further beyond is Bleaberry Fell, and yet further is Clough Head. Larger version of this picture.